Using the law to protect your rights and pursue your best interests is a top priority at The Williams Firm. The Firm is committed to resolving your legal matter as quickly and cost-effectively as possible while maintaining the highest standards of legal ethics and integrity. To arrange a free one-half hour consultation about your legal issue, please do not hesitate to contact an experienced attorney at The Williams Firm, in Walnut Creek, California. Whether you need a business law attorney to help you draft a contract or organize a new venture, a construction litigation attorney to resolve a property-related dispute, or a law firm experienced in protecting your intellectual property, The Williams Firm can help. For almost 20 years, hundreds of clients have depended on the attorneys of the Firm to help them in disputes and to advise them in transactions and business formations. 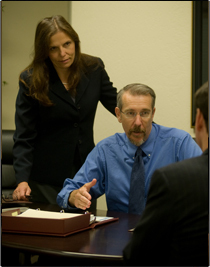 The attorneys thoroughly analyze your problem and devise a strategy for successfully reaching your goals. They remain focused on the right legal strategy even in situations that are highly contentious, high pressure or fast-moving. Contact an attorney in our Walnut Creek office today.